The one hundred and seventieth part of the Windows Presentation Foundation Fundamentals tutorial continues to look at the Window control. This article explains how one window can be set as the owner of another, and the effects of ownership. The window that has an owner can reference the owning window, gaining access to the owner's properties and other members. 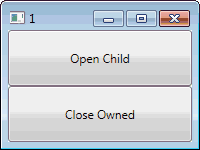 When the owner window is closed, all the owned windows are closed automatically. The Closing event of the owned windows is not raised. If the user minimises a window, all of the windows that it owns are also minimised. Minimising an owned window does not minimise the owner. An owner window cannot appear in front of a window that it owns, even if the owner is activated. When minimised, if an owner window is restored or maximised, any minimised, owned windows are restored. Run the program and try clicking the "Open Window" button. Each click opens a new instance of the main window with a different title. The title includes the title of the window that opened it, with an extra number appended. The windows are not linked; closing one window does not close any other, windows can be minimised and maximised individually and any window can be positioned in front of any other. To specify the owner of a window, you simply set the Owner property of the new window before it is displayed. The owning window must have already been shown to avoid an exception being thrown. Run the program again and launch some new windows. Try minimising and closing the owners to see the effects on the owned windows. Try moving a newly opened window in front of its owner, then activating the owner to see that it does not the window that it showed. When you have finished, close the window with the title, "1". Every window will close and the program will exit. The owned windows can access their owner using the Owner property. In some situations you will need to access the details of owned windows from the code of their owner. For example, before you close an owner, you may wish to check that all of the linked windows are in a suitable state to also be closed. If you don't, the user might lose data. Handily, whenever you set the Owner property of a window, a reference to the owned window is added to the OwnedWindows property of its owner. You can access the items in this collection individually or iterate through them all. Next, add the following method behind the window. This uses a foreach loop to iterate through the child windows. The Close method is called against each, closing the window and any other windows that it owns. Run the program and open several child windows. Click the "Close Owned" button to see that all of the owned windows close.